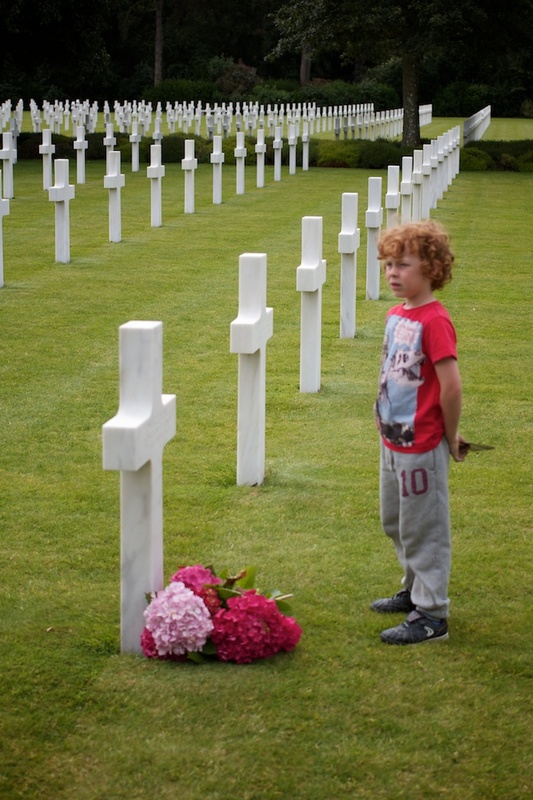 I think the family thought I was being a bit eccentric when I kept saying I wanted to see the cemetery at Omaha Beach for the American Soldiers. I’m not even sure why I wanted to go? Something to do with Dad flying in the war? Perhaps wanting to give Curly Headed Boy who loves computer games some perspective? Maybe to pay my respects? I don’t know, but I do know that I would definitely recommend anyone in Normandy visit one of the many sites related to the war. The atmosphere was lovely, it was quite breathtaking, and the kids seemed relaxed despite the message of the place. First of all you go into a building with great videos and pictures to take you quickly through the history of the war. It’s amazingly touching to see pictures of real life people and read about their real life stories. It’s not sad exactly, although I would admit big tears sprung to my eyes. It was more looking inspired/grateful at the thousands of lives sacrificed for our freedom. There is also a museum at a different location that Curly Headed Boy and the big hairy northern one went too (I was looking after a sleeping Little Dimples). He bought a brilliant book done in a cartoon style that explains lots about the war, which he has really enjoyed. On another day we popped to the British cemetery at Bayeaux, but unfortunately it’s not set out like the American one, so I couldn’t park nearby, and leave the tired kids with the big hairy northern one while it p*ssed it down; so I had to compromise with just driving past it. I’ve heard that because it has less pomp and ceremony it is actually even more touching. At Courseilles sur Mer (Near Arromanche) you can still see loads of evidence in the sea and on the beach of the D Day landings and when the tide goes out it looks like you can walk out to them (there was an awful storm, so we made a dash back to the car before we got a chance). My uncle died, lost at see and my grand mother never got over it. My Dad never talked about the war, but you could tell the gravity of what happened when you saw him reunited with his friends. What would life have been like if we’d lost? From Wikipedia I found the following quotes ..
Nazism favoured private property, freedom of contract, and promoted the creation of national solidarity that would transcend class differences. The Nazis outlawed strikes by employees and lockouts by employers, because these were regarded a threat to national unity. Instead, the state controlled and approved wage and salary levels. It is a variety of fascism that incorporates biological racism and antisemitism. – Near me is a place called Radlet, which must be 50% Jewish. That would be empty and none of Curly Headed Boys friends from his old school would have existed. I find that a shocking thought. – We wouldn’t have ‘My Big Fat Gypsy Wedding’, because Gypsies wouldn’t exist either. – Curly Headed Boy wouldn’t be going to street dance and tap dancing classes because we wouldn’t want the risk of him being marked as a potential homosexual. – I suspect that the power of women and Mums wouldn’t have grown to the extent it has today and we would have very much been stuck in the more traditional role of staying at home. – He hated the poles almost as much as the Jews, so there would be no Polish builders here; he would have probably been as ruthless there when he ran out of Jews to kill. – I doubt there would have been any immigration allowed or benefits cheats; which might sound OK in ways, but what about the people who really need and deserve benefits? – The improvements in racism wouldn’t have happened and the big arrival of West Indians after the war to help rebuild Britain wouldn’t have happened. Bristol where I was born wouldn’t have had such a big Jamaican community and if I was Nigerian I wouldn’t come over to england, so Curly Headed Boy’s best mate at nursery and reception wouldn’t have been here. – What about the World Wide Web? Maybe something underground would have kicked off, but nothing to the extent that we have now and not with the freedom that we enjoy. – Blogging would be definitely outlawed; especially a pile of opinionated women bloggers stirring up trouble like us Mummy Bloggers. – No Facebook or Twitter; lots of time saved maybe, but the amount I learn everyday from the sheer speed of information sharing. – There’d be no recession, because although he encouraged nationalism and industry, the wouldn’t have let the banks have such a free reign and we wouldn’t have been allowed to be so greedy and get ourselves into such a state of wanting more stuff and getting more debt. Would it have lasted? I doubt it, because the power of the resistance is strong and extended himself too much. The scariest thought is that the cold war would probably still have existed and Hitler would have had the bomb. The likelihood of someone with his nature using it would have been very high. It’s given me a real sense of perspective going to see all those graves. Although life is tough for most of us at the moment with the recession, the fact that our lives could easily have been so different is humbling. I’ve always taken note of remembrance day, but from now on I won’t just ‘remember’ the people who died, but I will also remember how lucky we are to have the freedoms to make the mistakes and the great creations that we have today. Disclosure: I was on a review trip of a Siblu mobile home site called Domaine De Litteau and received a return ferry trip with Brittany Ferries and a weeks holiday for the family, we bought an extra week ourselves. It has not affected my review and my opinions are still my own. I think that was a really well written and thought provoking post. My grandmother was a Jewish refugee from Nazi Germany who came over to England on the Kindertransport when she was just 12 and she witnessed many of the horrors of the Nazis firsthand. I think its really important that as time goes on we don’t forget what happened during WW2 and appreciate the freedom and tolerance that we have today and that we teach this to our children too so that hopefully it can never happen again. Thank you hertfordshire mummy, it’s good to know that coming from a jewish background you didn’t feel that I was being patronising – such a difficult subject to talk about. A terribly important post. those numbers are shocking. lest we forget. Thank you lovely Anya – yes, it will mean much more to me now when they say ‘lest we forget’. So glad my kids will understand better too.